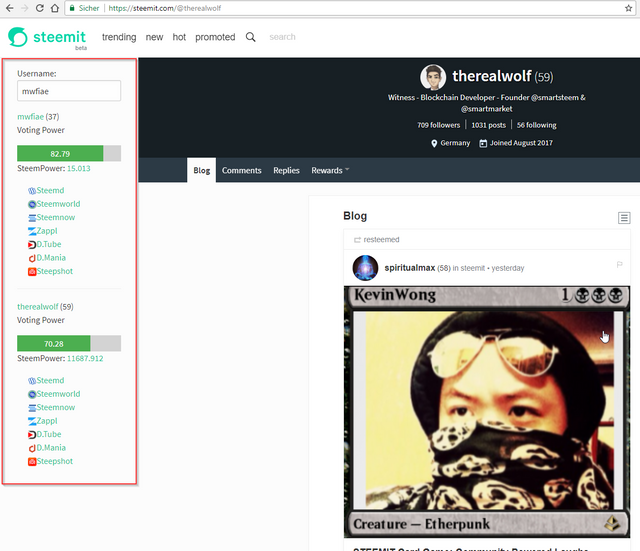 This is a Tampermonkey-Script designed to show a bar on the left side of steemit with a few practical links and informations about the current user (editable with an input field) and the user that is currently displayed (profil or posts). You can currently see the current Reputation, Voting Power and SteemPower (the link brings you to the steemit profil, as well as the wallet). Furthermore you can use the links to open a new tab to another website with further Informations to the profil. It saves the user that is written in the "Username" input field in a cookie. It should work just fine without cookies enabled, but then you would have to input your name everytime you want to see the infos about yourself. Of course fixing any bugs that would appear. Install the Tampermonkey Addon for your browser (the pictures are clickable). Click on this link and click on install. Go to steemit.com and refresh the page with F5. Enter your username in the input field on the left side and hit Enter! Hey @mwfiae I am @utopian-io. I have just upvoted you! I'm so thankful for all the support and help and motivation I'm receiving from this community, even though I'm only just a part of it for a few days! Great script. Thank you very much. 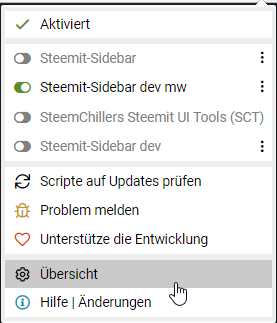 I have a question though: I'm also using the Chrome Extension "Steemit More Info" ( https://chrome.google.com/webstore/detail/steemit-more-info/dcbpmclnlapbkgkddhencielibcjogcf ). After enabling your script, I get the following error in the extension: "Die Erweiterung konnte den Antwort-Header "content-security-policy" einer Netzwerkanfrage nicht modifizieren, da die Modifikation einen Konflikt mit einer anderen Erweiterung (Tampermonkey) verursacht.". Is there a way for me to edit the script (with the error message I posted) so I can keep using both tools? Thanks in advance. Change the Configuration Mode to "expert"
Then go to Security and change the csp setting to "no"
Hi! Thanks for the response. I just tried it, but still couldn't get it to work. So i checked all my extensions and found out that if I turn off the "Privacy Badger" extension in chrome and switch the csp setting to no like you explained it works! Thank you! Don't stress yourself though, I'm probably one of very few Steemers, who use both tools. Might also just be a problem on the Chrome extensions end. Thats looks like a very very useful tool for every steemian! Extrem geiles Skript! Konnte es gar nicht fassen, dass ich direkt so ein geiles Userscript für steemit, und dann auch noch von nem deutschen Author, finde. I will follow the project progress. Good job! Thanks to @obvious you have planted 0.50 tree to save Abongphen Highland Forest in Cameroon. Help me to plant 1,000,000 trees and share my Steem Power to the others. Selfvoting is prohibited, but that should be the reason to spread the world to protect our precious environment. Check out profile of our conservation association @kedjom-keku and the founder/coordinator @martin.mikes to get more information about our conservation program. My current SP is 14515.72. Help me to plant more trees with your delegated SP.